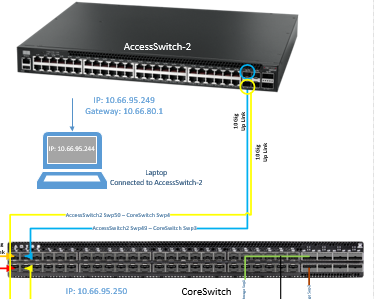 I am trying to bundle my two ports like swp1 & swp2 both are 10G ports so I need the traffic to be flow as 20G so I want to do Bonding for that but if my swp1 and swp2 ports are trunk means I am not able to bond them can I know how can I achieve this thing? if active bond, you might want check if LACP is talking to each other, could it be remote is not sending LACP BPUD? Currently my up-link ports are in trunk mode and inter VLAN communication is happening, need to make that up-link ports in one bond i.e., (2x10G up-link = 20G). If the ports swp1 and swp2 are already members of a trunk, then you can not enslave them. First remove the ports from the bridge, then add them to a bond, and then you can add the bond to the bridge for trunking. Thank you for your help..! !